Valerie H. Marshall: Be Mine Rain Or Shine! Be Mine Rain Or Shine! Wishing you a day filled with friendship and love. I had loads of fun with the coloring with my Copic Markers for this card; however, fussy cutting around Heidi took a while!! The background doily was created with the Sophia's Heart die by Cheery Lynn and the red heart matt was created with the Heart To Heart die by Cheery Lynn as well. Inside this card reads, "Rain Or Shine!" 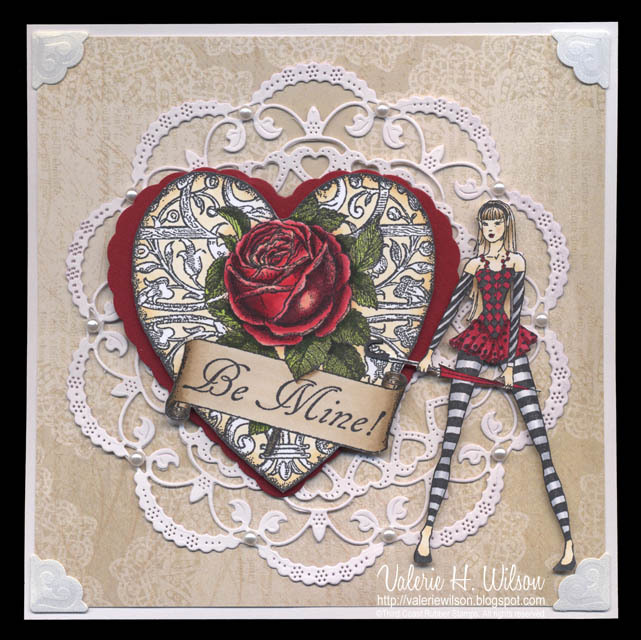 Quietfire Designs is having a Queen of Hearts Celebration today, so I plan to join the fun and share this project over there! For this was on seynt Volantynys dayWhan euery bryd comyth there to chese his make. Have a chocolate kind of day! This is wonderful! I love your sassy "Heidi" with her stockings. I need a pair of those! Thanks so much for joining the Queen of Hearts Challenge! !